הפוך מטבע הראשון: קפטן ארצ'ר צבעוני כפי שנראה דרך האינסיגניה של Star Trek. תבליט מבט מעל של ה-U.S.S. Enterprise NX-01 והמילים "Captain Jonathan Archer". מטבע השני: תבליט של ה-U.S.S. Enterprise NX-01 מעל נוף צבעוני של עולם בודד. מטבע הראשון: קפטן ארצ'ר צבעוני כפי שנראה דרך האינסיגניה של Star Trek. תבליט מבט מעל של ה-U.S.S. Enterprise NX-01 והמילים "Captain Jonathan Archer". מטבע השני: תבליט של ה-U.S.S. Enterprise NX-01 מעל נוף צבעוני של עולם בודד. סט של 2 מטבעות כסף Star Trek: Enterprise במצב Proof שנת 2015 משקל כל אחד אונקיה This beautiful, colourized proof like coin has vibrant colours, a highly polished appearance and comes with a numbered certificate of authenticity. 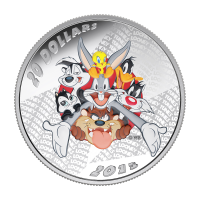 The mintage, including the two coin sets, is limited to only 6500 coins worldwide meaning that this is sure to become a prized coin for both numismatic collectors and Star Trek fans. Star Trek: Enterprise ran for four seasons, and is the last of the T.V. series to have been produced. The series was set 115 years before the original series, and featured the first ship fast enough to explore interstellar space. The obverse of both coins features the Ian Rank Broadley effigy of Queen Elizabeth II and the words "Queen Elizabeth II 1 Dollar Tuvalu 2015" and the artist's initials. 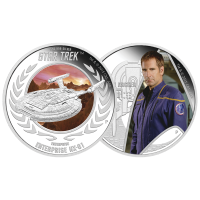 The reverse of one coin features actor Scott Bakula, in the role of Captain Jonathan Archer. Archer is pictured standing with the bridge of the Enterprise in the background. The reverse of the other coin features a relief of the U.S.S. Enterprise NX-01 majestically soaring over a colourized planetary scene. 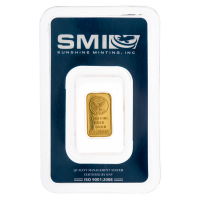 The wreath of laurel leaves surrounding the edges of the coin mimic the logo of the United Federation of Planets and were used in ancient Rome to symbolize victory. The Enterprise NX-01 "was" launched in 2151 and is the first vessel capable of Warp 5 speeds launched by the United Earth Starfleet. This set, like the original run of the series, is strictly limited, get yours today before they are all gone!